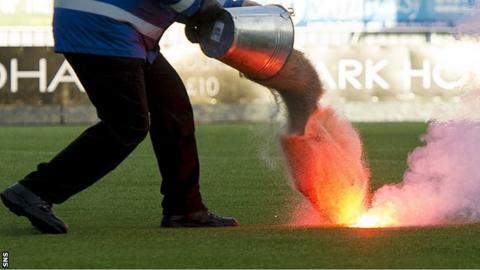 Rangers say they are "extremely disappointed" after a lit flare was thrown onto the pitch during the Scottish Cup match against Falkirk. The device was set off from the North Stand at the Falkirk Stadium. with Nicky Law and David Templeton scoring. "These devices are inherently dangerous and represent a real risk to fans, players and match officials," said Rangers in a statement. "Today's incident has resulted in the playing surface being damaged and the club are now investigating this matter and will be supporting the police with their inquiries." Falkirk manager Gary Holt was also unhappy about the flare thrown onto his club's synthetic surface. "I'll bite my tongue on that one, but I'm not happy about it," he said. "It's something that's happened and it's not a nice thing. I don't think Falkirk are too happy about it. "It's mindless people who come to football sometimes and just want to be disruptive, but you can't ban everyone."